Gear up, train and prepare for a unique Batman from the DC Collectibles Artists Alley! 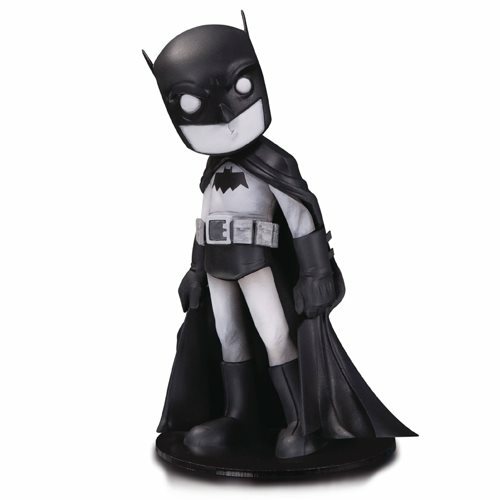 The DC Comics Artist Alley Batman by Chris Uminga Limited Edition Black and White Version Statue measures about 6 3/4-inches tall, made of PVC plastic, and comes in a 5th panel box packaging with sketch card from Chris Uminga. The statue is a limited edition of only 500 pieces worldwide! Christopher Uminga, a Connecticut based painter and illustrator finds influence in classic movies, Saturday morning cartoons, graffiti and low brow/outsider art throughout his work. Batman by Chris Uminga, manages to sum up so many of Batman's iconic qualities into one illustration and figure. He's not only confident, but a little grumpy, annoyed and overall moody. In addition, Batman highlights Uminga's blend of "creepy and cute" in to one truly awesome figure.